High amino acid dosage in 1 product portion! 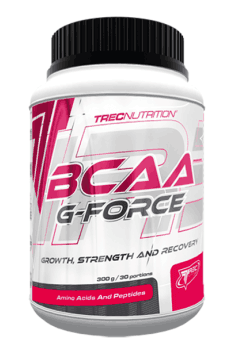 Trec BCAA G-Force is a preparation with high branched amino acid content. Its powder form makes it convenient and easy to prepare a fully nutritional shake. Its active ingredients comprehensively support muscle anabolic processes. The addition of L-glutamine inhibits muscle catabolism by getting rid of toxic substances accumulated during training. Every day several dozen grams of new proteins are degraded and produced in human body. These include enzymes involved in food digestion, antibodies protecting the organism against micro-organisms, albumins keeping up correct oncotic blood pressure, proteins transporting hormones or drugs, as well as proteins with many other roles. Most of them is synthesized in the liver, but it is not their only place of origin. Structural proteins are a large protein group which is produced directly in target tissues. They support cellular cytoskeleton and their general functioning. Muscle fibres are an excellent example of this type of proteins. Many adepts of weight training wonder how to stimulate protein biosynthesis process in a muscle, which leads to - simply speaking - muscle building. They often forget that weight training is one thing, but the building block - top quality protein with complete amino acid profile - is equally important. It is obvious that heavy training brings along many micro-injuries in muscle fibres. To regenerate them, the organism uses systemic protein poll (circulating with blood, or, in extreme conditions, derived from other body structures). Therefore, the demand for them grows, which is translated into dietary requirements. Some of the twenty amino acids can be produced by the organism itself - they are called endogenous non-essential amino acids (NEAA). Unfortunately, there are also such, which have to be provided from the outside - these are called exogenous essential amino acids (EAA). Bearing this in mind, it is worth supplementing yourself with a top-quality nutrient containing all of them. There is one more set of so called BCAA - branched chain amino acids, which have a particularly positive effect on anabolic processes in muscles. Many studies have shown that L-Leucine is the key element of biochemical transformations chain. Thanks to its availability, it is possible to stimulate muscle protein synthesis, and in turn intensify development of new fibres. It was also observed that leucine should be accompanied by the presence of L-Valine and L-Isoleucine to make the best of the anabolic potential. Taking these three amino acids together with the rest of EAA contained in the diet boosts muscle regeneration. Hard work of muscle cells stimulates them to grow, but also leads to formation of new compounds in the course of separate transformations. These can be toxic in large amounts. They include ammonium derivatives produced during protein breakdown. The unsolicited compounds are removed by intracellular transamination process, which ‘sends’ the toxic molecules to the liver. One of ammonium transporters is L-glutamine. Although this amino acids belongs to NEAA group (which means that it does not have to be supplemented), but intense weight training may exhaust the body’s resources of this compound. By getting rid of excessive harmful compounds, this amino acid supports regenerative processes and may increase efficacy of muscle work during intense effort. Synergistic action of preparation ingredients leads to even greater muscle mass development. What is more, glutamine is a compound which is a source of metabolic energy necessary for proper functioning of leukocytes and enterocytes. This may result in improved immunological capacity of the organism, for example not catching a cold. It also indirectly supports absorption of substances crucial for muscle tissue development. To sum up, Trec BCAA G-Force is a preparation which increases intensity of anabolic processes in muscle cells to their maximum extent. What is more, thanks to glutamine, it inhibits excessive damage of muscle fibres by accumulating toxic substances. By taking this supplement you can visibly improve your weight training results and - in turn - your body composition. Bardzo dobre bcaa, jedne z lepszych jakie stosowałem. I portion (1,5 scoop) 30 minutes before training, II portion (1,5 scoop) immediately after training. I portion (1,5 scoop) in the morning after waking up, II portion (1,5 scoop) before sleep. Used before training, it protects against catabolism and increases energy reserves of the organism and used after physical effort, it stimulates growth and regeneration of muscle fibers. Wash down a single dose of the supplement with 300 ml of water. Depending on your needs, use 1-2 portions a day. Do not dissolve the product. Maltodextrin, acidity regulator (citric acid), flavors, sweetener (sucralose), coloring agent (beta-carotene).